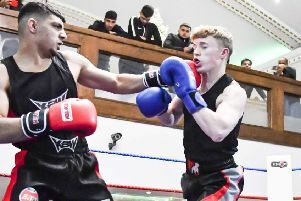 Freddie Phillips continued his impressive form with a third straight victory on the KBW show at the Al Hikmah centre in Batley last Friday. Phillips beat Declan Blackley (Kingston ABC) in a bout fought at 34kg. After an initial good start from Blackley, Phillps was able to establish his rhythm and take the first two rounds. Phillips maintained the pressure at the start of the third round an although he was caught by his opponent late in the final session, he had already done enough to take a unanimous points win. His latest win came after victory on a show in Knottingley the previous week. Phillips has another fight lined up in Peterborough on October 6 as he looks to maintain his impressive recent form. Noah Nicholls accepted a tough fight against unbeaten opponent Micheal Haley (Laisterdyke BC). He put up a great effort but but could not find his range to work on the inside. The fighters kept the crowd on their feet in a closely fought contest but the bout was awarded to Haley. It was a great learning fight for Nicholls, who knows what he needs to do to progress to the next level.